Earlier this week I had the distinct pleasure of announcing the winners of the Green Chemistry Initiative’s Future Leaders in Green Chemistry Challenge, and it was truly inspiring to see so many people talking passionately about how green chemistry fits into their work here in the Department of Chemistry at the University of Toronto. As chair of the GCI, I have been thinking about starting a blog of sorts to help us share news about our exciting projects and cool things that come up in the world of green chemistry – and summarizing the events of the Future Leaders in Green Chemistry Challenge seemed like a great place to start! During ChemClub’s Departmental Poster and Networking Session held Tuesday, October 22nd, 2013 in the Davenport Atrium, the participants of our challenge presented their applications, either a poster or written statement, showing how they currently or propose to incorporate green chemistry into their research or the department’s educational curriculum. 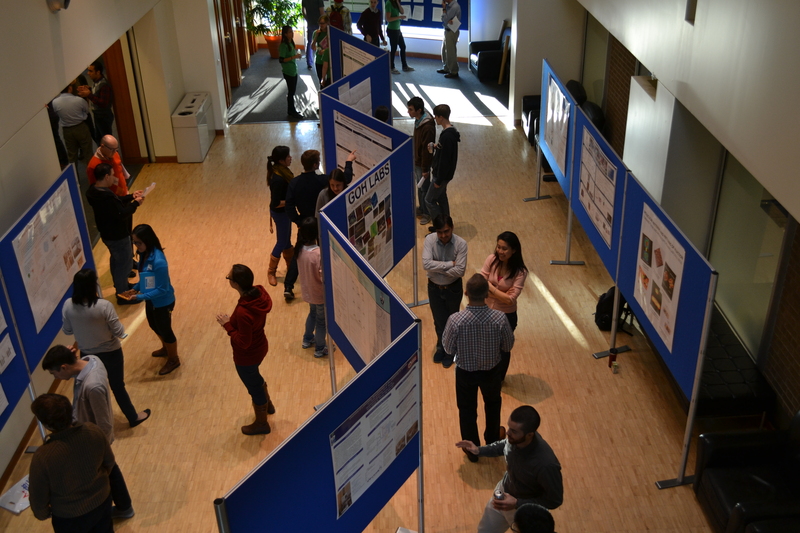 There was a great turnout at the poster session – particularly when the free pizza was served – so it was an ideal venue at which to host our challenge. It was also really nice to see so many students and members of our department networking and talking about their research in general, so congrats to ChemClub for putting together this wonderful event! We had many terrific entries in the Future Leaders in Green Chemistry Challenge, and the faculty we recruited to judge the challenge were quite impressed! I am very grateful for the time and effort our judges put into reviewing the entries and chatting with the applicants, so thank you Dr. Andy Dicks, Dr. Effiette Sauer, Dr. Barbora Morra, Prof. Jamie Donaldson, and Prof. Gilbert Walker. In the education category, Nadine Borduas of the Murphy and Abbatt Groups won the $500 scholarship for her proposal to incorporate a green chemistry assignment into a third year organic chemistry course. The proposed assignment asks students to perform a retrosynthetic analysis of a given molecule, assess the “greeness” of each transformation, and justify their choice of route using the recently published GlaxoSmithKline reagent guide (Green Chem., 2013, 15, 1542-1549.) and solvent selection guides (Green Chem., 2011, 13, 854-862; Green Chem., 2008, 10, 31-36.) Adding this assignment to the curriculum will give students the opportunity to learn about the 12 Principles of Green Chemistry and train them to think intuitively about how to create a more sustainable research environment by using greener reagents, while practicing their retrosynthetic analysis skills. This assignment is set to get a trial run this winter as part of CHM343H and we look forward to hearing how it goes! The GCI is proud to congratulate the efforts of all the participants of the challenge, who went home with a little something for their participation: Brandon Djukic (Seferos Group), David McLagan (Wania Group), Gnana Sutha Thomas (Zamble Group), Jonathon Moir (Ozin Group), Landon Edgar (Nitz Group), Lulu Huixin Lu (Woolley Group), Mark Miltenburg (Seferos Group), Paul DiCarmine (Seferos Group), Peter Sues (Morris Group), Wei Sun and Chenxi Qian (Ozin Group). Since founding the GCI just over a year ago, we have received so much support from many people in the department, which we are very grateful for. However, we have also struggled to get others to see the value in green chemistry, which in my experience is a challenge faced everywhere by green chemistry enthusiasts. 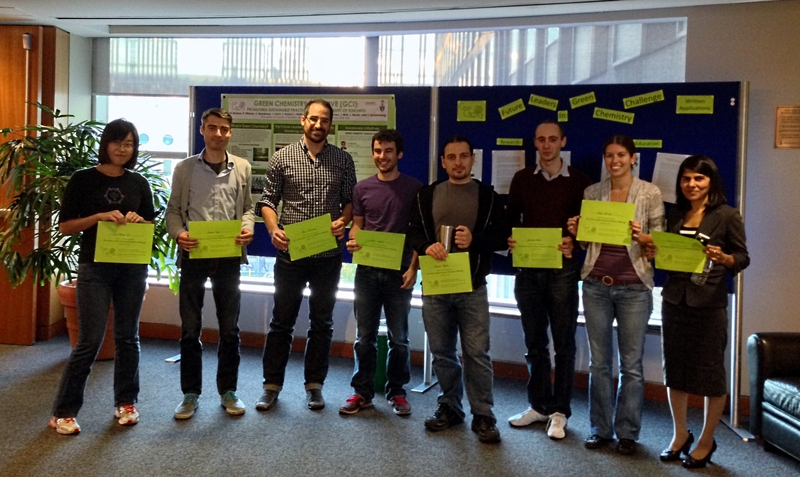 With successes such as the Future Leaders in Green Chemistry Challenge and the great attendance we had at our recent Green Chemistry Seminar Series talk given by Professor C.J. Li from McGill University, it appears that we are in fact making an impact in getting our chemistry community thinking about green chemistry. We have had several new members join the GCI team this year, and are excited to continue growing to bring the department more opportunities to learn about green chemistry and share their knowledge. Once such opportunity is the start of our Green Chemistry Journal Club, which will have its inaugural monthly meeting November 7th, 2013 from 4:30-5:30pm and all are invited to attend! More details will be announced shortly, but I can tell you that GCI members Kenny Chen and Laura Hoch, who are avid bakers, will be providing the treats for the first meeting! Hopefully we’ll see you there or at one of our other GCI events soon!